Our final EUROPETOUR meeting took place in the German region of the Tauber valley, hosted by our coordinating organisation Kultur und Arbeit e.V. in cooperation with Bronnbach Monastery and the International Convention Center for Cultural Heritage Preservation IZKK. The region is world famous as part of the so-called “Romantische Straße” (Romantic Road), which was one of the very first routes used for tourism marketing in Germany. It links jewels of architectural heritage in southern Germany and combines the historic cities of Würzburg and Augsburg with the three medieval walled towns of Rothenburg ob der Tauber, Dinkelsbühl and Nördlingen, and then finishes off with the tourist highlights of Neuschwanstein Castle and the Alps. Therefore, the last EUROPETOUR meeting was dedicated to cultural touristic routes and networked offers, which came out as one of the most important success factors for cultural tourism in rural areas throughout the project’s history. 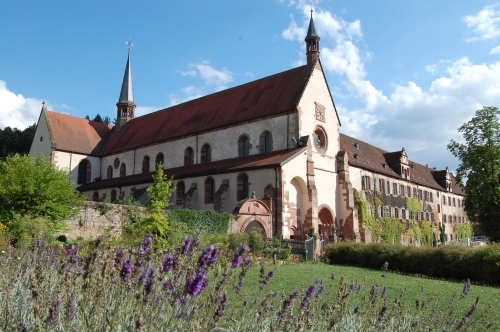 The EUROPETOUR team learned about the highly networked approach on a local tourism level represented by the former Cistercian Bronnbach Monastery and the IZKK, which is an educational platform for communicating the latest research in heritage preservation. The team also learned about another regional route, which is dedicated to cultural and culinary delights, the so-called “Straße der Genüsse” (Route of Delights). Study visits to the glass museum in Wertheim and the Schlör family winery (both dedicated members of the “Route of Delights”) contributed to the information generated on successful networking for cultural tourism. Looking forward to learn more! Stay tuned and follow us through our Social Media networks on Facebook, Twitter and Flickr! What a wonderful meeting with so many fruitful experiences! Thanks so much to all the dedicated colleagues for coming to the Tauber valley, finalizing all our tasks we had to do for the EUROPETOUR initiative! Now we hand over all our results to the experts’ public and let them benefit the way the team members benefited during three exciting years!